This is a home cooked dog food your chihuahua will love. This is a lovely thick oxtail & drumstick juicy stew that your chihuahua will love. Simmered all day in the slow cooker to bring out the richness of flavour. Both oxtail & turkey drumstick are inexpensive cuts of meat. You can add a splash of apple cider vinegar to draw out the goodness from the bones. Sweet potato is high in dietary fiber and low in fat, it also add a touch of sweetness that your dog will love. Parsnips are a bit of a super food, high in vitamins and potassium they are help protect against colon cancer. 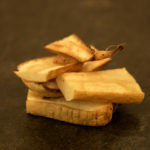 Parsnips are also has anti-inflammatory and anti-fungal properties. A hearty home cooked dog food stew that will have your dog drooling. Cooked gently in the slow cooker with a drop of apple cider vinegar to pull all the gelatinous goodness out from the bones. Both meats are relatively cheap as well. Boil the kettle, and add the drumstick and oxtail to the slow cooker with the hot water.Pour in a splash of Apple Cider Vinegar. This brings out all the goodness from the bones. Chop up the vegetables leave the skins on and add them to the pot. Pour in a splash of Apple Cider Vinegar. This brings out all the goodness from the bones. Cook on high for a couple of hours then turn down the pot and let it simmer all day or overnight. Once it has cooled add your bone meal, brewers yeast and salmon oil. You can also add in some seaweed for extra teeth cleaning benefit. The bone-meal, brewers yeast and salmon oil should be part of your home cooking store cupboard ingredients. You can buy them from AniForte. Once you have them in stock they last for ages. Keep the lids on tight. How much you put in will depend on the size of your dog, the above is an approximate amount. So read the packet for feeding instructions. It doesn’t matter if the vegetables are in different ratios to the list above, as long as you have a 70/30 split of meat and veg. The calories will change slightly but not enough to worry about. It is a shame to chuck out the resulting stock, so you can freeze it for your own soups and stews. Next Post Help! My Chihuahuas Don’t Get Along.